Sandhurst Cove is a gated community located near Jackson Street and 42nd on the North side of I-10 in Indio, CA. The neighborhood features all single story homes and a grass park area near the entrance. The homes in Sandhurst Cove range from 3 to 5 bedrooms starting around 1700 square feet to more than 2900 square feet. The neighborhood has considerably large lot sizes with most lots having a minimum of 8000 square feet. The homes in Sandhurst Cove were built in 2004 and 2005 and have open, spacious floor plans. Some homes feature options such as casitas, fireplaces in living area or master bedroom, covered patios, and 3 car garages. Looking for a Home in Sandhurst Cove? 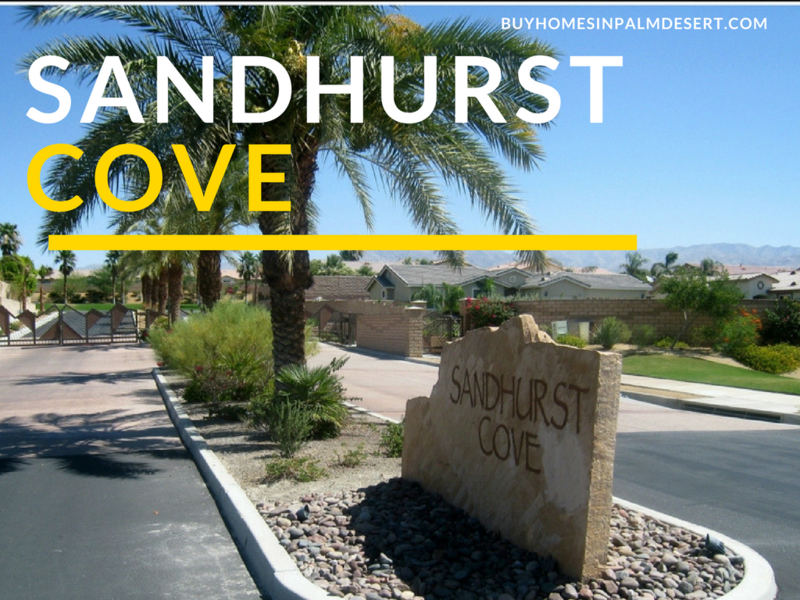 Click here for the most current list of homes for sale in Sandhurst Cove in Indio, CA. Sandhurst Cove is most desirable for its low property tax base. Unlike most of the neighboring communities on the North side of Indio, Sandhurst Cove does not have mello roos. The home sites are also elevated as you go through the community so even though you may have a neighbor behind you, chances are their house sits lower than yours so you have better mountain views. Low monthly HOA fees of approximately $103/ are also a desirable plus. What's going on nearby the Sandhurst Cove community? Sandhurst Cove has great walkability to local shops, restaurants and grocery stores. It is conveniently next door to the Indio Public Golf Course. Nearby stores include AM/PM Gas & Convenience Store, Auto Zone, Home Depot, Walgreens, Winco, Target, and Big Lots to name just a few. You literally have access to so many stores right at your fingertips. Sandhurst Cove is less than 10 minutes to La Quinta and 20 minutes to central Palm Desert. Located right off the freeway, Sandhurst Cove homeowners who commute have easy access to the on & off ramps. What schools with the kids attend? Schools of attendance for Sandhurst Cove are Andrew Jackson Elementary, Desert Ridge Academy, and Shadow Hills High School. Click this link for a great tool to search school boundaries by entering your property address.